Summary: The idea for The Comfort of Apples came to chefs Philip and Lauren Rubin when, after an afternoon spent picking apples at a local orchard, they looked at each other and wondered, "What do we do with them?" With the abundance of apples filling farmer's markets, supermarket produce sections, and orchards every fall, it is a rare soul who doesn't wind up with a veritable bounty of apple varieties filling their larder for at least several months out of the year. And yet many cooks don't realize that apples have infinite cooking applications beyond sauces, crisps, and pies. As this beautifully illustrated book shows, they can be julienned raw in a salad; poached whole in wine; used in the form of cider as a deglazing or braising liquid; fermented into warm drinks; or juiced and turned into sorbet. The list goes on. Apples are one of my all-time favorite foods, so when I discovered that there was a cookbook devoted to this fruit, I jumped at the chance to review it. 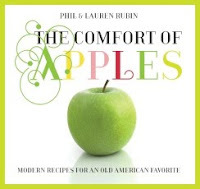 THE COMFORT OF APPLES: MODERN RECIPES FOR AN OLD-FASHIONED FAVORITE by Philip & Lauren Rubin is a gorgeous cookbook that both gourmet cooks and apple-lovers should definitely check-out. I was pleasantly surprised by the variety of recipes in THE COMFORT OF APPLES -- there are over 100 apple recipes.The cookbook is divided into chapters according to the types of food; however, there is also an Introduction section which includes some general information about the history of apples and apple recipes. I particularly liked the handy little Apple Tasting Chart which gives the apple name along with the flavor and recommended usage. (For example, Granny Smith apples are "tart" and recommended for "eating" and "pie.") The following chapter titles include Breakfast, Snack, Sandwiches, and Salads, Appetizers, Meat and Poultry, Fish, Pasta, Sides, Dessert, Sauces and Condiments, and Cocktails. The photographs in THE COMFORT OF APPLES are beautiful. In fact, the cookbook is almost pretty enough to display on your coffee table. There are loads of photographs of apples, apple trees, and various ingredients; however, I was a bit disappointed that there weren't photographs of the recipes. It's not essential that I have pictures of the end result, but I admit that I do prefer cookbooks with color pictures of at least some of the recipes. When I first picked up the cookbook, I was expecting a lot of apple dessert recipes; however, I was surprised that most of the recipes weren't dessert ones at all. There were loads of apple recipes with all kinds of meat including duck, bacon, salmon and tuna; and I admit that I was a little surprised by some of the combinations. I'm sure that if I were served these dishes in a restaurant or someone else's home, I'd think they were delicious; however, I admit that I would be hesitant to try them for my family. In addition, I found many of the recipes to be "tres gourmet!" I don't mean that they were extremely difficult to make -- just that they had unique flavors and ingredients. There were quite a few recipes that appealed to me, but I finally decided to make the plain old "Apple Cake." The authors state that sometimes "the best recipes are those handed down through generations of a family." And that's exactly what this recipe reminded me of -- an old-fashioned apple cake. It was quick and easy to make and turned out beautifully. I actually served it to my book club and it was a big hit. This apple cake was extremely moist and almost reminded me of the Tastefully Simply Nana's Apple Cake -- but better because it was homemade! 1. Preheat oven to 350 degrees. Grease a 9x13-inch baking pan. Line pan with waxed paper and grease the paper. 2. In a large mixing bowl, beat together oil, sugar, and eggs until well blended. Add flour, baking soda, salt, cinnamon, nutmeg, and vanilla. Beat for 2 minutes at medium speed; the dough will be very thick. Remove bowl from mixer and fold in the apples. 3. Pour cake batter into prepared pan, smoothing the top to make an even layer. 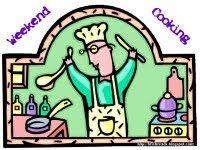 Bake for 25 minutes, then reduce oven heat to 300 degrees and continue cooking for 35 to 40 minutes. Cake is done when a toothpick inserted in the center comes out clean. 4. Remove cake from oven and set aside to cool for 5 minutes. Carefully, turn cake out of pan and remove waxed paper. Instantly turn cake back over so that the "pebbly" side of cake is up. Thanks to FSB Associates for sending me a review copy of this gorgeous cookbook. Yummy!!! I love fruit, but apples are probably one of my least favorite, so I probably wouldn't cook many recipes from this book, but that cake sure sounds good. I saw this reviewed elsewhere too with some pictures shown. They really are beautiful! Wow. Just the title of this book spoke fall to me. I LOVE apples and cook with them often. I am adding this to my birthday wishlist. Thanks for spotlighting it. Apple picking in the fall is one of the few things I miss from living up north - this book sounds great! We were just apple picking last weekend. I NEED this cookbook! Yum! I haven't had apple cake in a really long time, since I lived at home, and don't have a recipe myself. I'm going to be copying this one! This is definitely a different apple cake recipe and sounds good. When I first heard the title of this book I thought I knew the cookbook -- but I was thinking of a memoir called Comfort Me with Apples. This is a new to me book. Apples are one of my favorite fruits but I don't have many recipes using them, aside from some pies and a cake or two. I love the idea using apples in meals other than desserts but I certainly would also love to give the apple cake you cooked a try! I enjoy cook books with wonderful photographs, too, and am someone who spends hours reading cookbooks! Thanks for a great review, Julie. I saw this book on a couple of websites & was intrigued. Now I know it's a great book! Hubby and I both love apples so I'll have to look for this one.